Widely ridiculed this week for filing copyright takedown notices and threatening legal action against a blog that criticized his artwork, Darkchylde creator Randy Queen now acknowledges his response "was the wrong one to take." "I have been having a very hard time in my personal life with the loss of my mother and my marriage having fallen apart and found myself in a very vulnerable and fragile state of mind," he explained this morning in a Facebook post. "There were posts on the web criticizing my artwork that were brought to my attention and added to my stress. I reacted without thinking it through, but have now stopped, realizing my response was the wrong one to take. I am doing my best, each day, to get myself back on my feet and getting my life in a better place and realize now that I have just try to move on and get back to my art, the thing I find the most joy in these days. I want to thank those professionals, friends and family who have been giving me their support, understanding and love." Queen had taken exception to critiques of some of his Darkchylde work on Escher Girls, a blog devoted to examining the way women are depicted in “illustrated pop media,” including comics. He sent Digital Millennium Copyright Act takedown notices to Tumblr alleging copyright infringement in nine posts containing his covers. Entire posts, rather than just the images, were removed by the company. 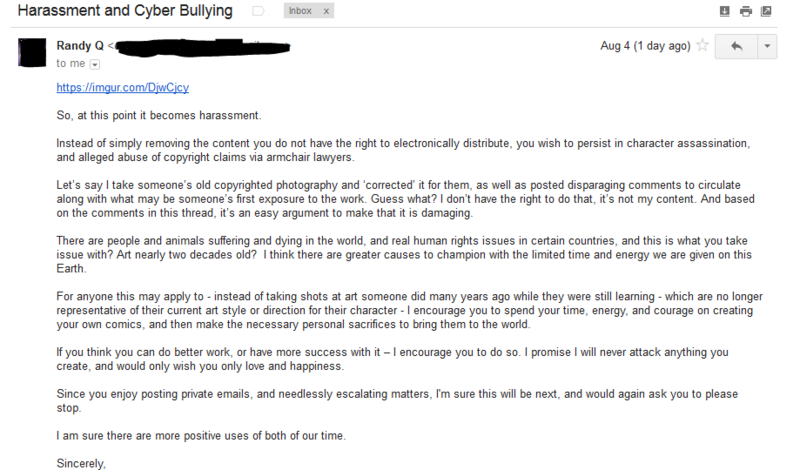 When the blog's administrator, Ami Angelwings, wrote publicly about his actions on Saturday, Queen attempted to have that post removed, and sent an email threatening to sue for defamation and "publicly challeng[ing] my right to protect the perception of my IP as it exists today." He followed that Monday with another message accusing Ami Angelwings of defamation and "character assassination." She provides a timeline of events on Escher Girls. The story spread quickly online, with everyone from Techdirt and Chilling Effects to John Scalzi and Wil Wheaton weighing in on what was widely viewed as an instance of a creator using the DCMA to silence criticism. Ken White of Popehat even helped Ami Angelwings to secure a lawyer. But now it appears no legal representation will be necessary.